CLAYTON, Mo. – St. Louis County Council members have continuously made efforts to increase the pay wages of county workers. At Tuesday’s regular meeting, council members continued their debate on giving funds to departments when the county’s budget shows there is not enough to do so. An ordinance: Amending Chapter 202, Title II SLCRO 1974 as amended “Personnel Classified Service,” by repealing and re-enacting sections 202.360, 202.365 and 202.366, each pertaining to various pay range structures. Council Chairman Sam Page explained that the bill would authorize a 2.8 percent increase for county employees in the merit system. Councilman Ernie Trakas said he was concerned with the bill because the county has already experienced a “surplus loss” and wouldn’t be able to cover the funding necessary for the bill. Trakas shared that the county’s budget began with $16 million to $9 million. Before Tuesday’s meeting, members learned that the funds were not at $4 million. “Funds would be given when and if the county had the means to do so,” Trakas said. Councilman Mark Harder shared the same concern and suggested that the council come to a “screeching halt” for a few weeks before they consider any type of funding. Councilwoman Lisa Clancy shared her agreement with Erby. Page said that the bill, if passed, would not be an appropriation of funds but rather give authority in hopes that departments would be able to afford increases in wages through their 2019 approved budget. The council unanimously agreed to adopt the substitute bill, and Page held the bill for final passage. “We keep holding this and the employees are not going to get this pay raise retroactively,” Erby said. With County Executive Steve Stenger present at the meeting, Erby believed that he was the person that could give an explanation to the “disappearance” of the money. Stenger referred to the budget director, Bill Miller, who was in attendance of the meeting. He said that Miller would be able to give a proper explanation. He also mentioned that budget director Paul Kreidler would be able to give the council whatever information they wanted, noting that Page is in regular, constant communication with Kreidler. Erby then asked Stenger why the county is in this “crunch” when he is consistently hiring new people in new departments. According to Stenger, he, like the rest of the council’s department, has people come and go as well as a budget that has to be lived within. 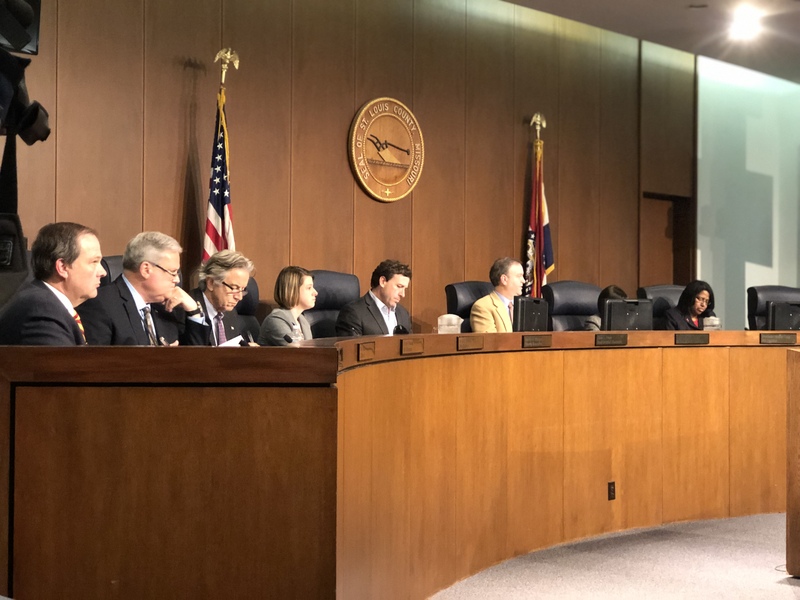 Page told Stenger that the council is looking for someone in his office to release the report explaining the description of the transfers that were made to adopt any appropriations in the budget, as well as an explanation from the second report. According to Page, there was a difference between the two reports, totaling nearly $12 million. The council would like to better understand why it was not posted on to the original report. The council asked to have the reports and their explanations by next week, which Miller shared he would be happy to review. Stenger said the councils’ questions are good questions that have answers but that it is his understanding that Kreidler is still working on compiling the information and answers together. He said that knowing the many hours spent in hearings for the budget there is not a lack of information that will be available.